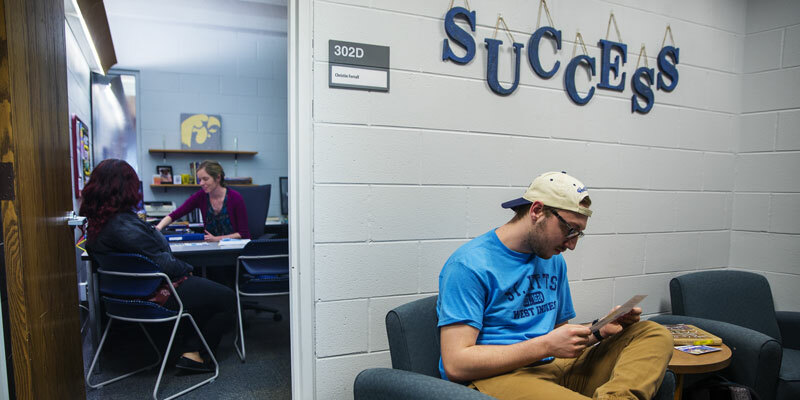 The Student Success Center is here to assist you in developing your personal pathway to success. Success Coaches work with students to discover what success means to them and how to apply it to their personal and academic lives. Together, a Success Coach and student work to develop goals, manage time commitments, create study habits, plan out academics, and much more. How do you measure success inside and outside of the classroom? Success Coaches assist you in developing realistic and achievable goals. We will work to pinpoint your strengths and areas of growth to best measure your success. Do you struggle to balance your time commitments? Success Coaches work with you to design a personal time-management system. We will map out your semester with activity logs, develop schedule overviews, and review syllabi to best prepare for your success. Do you need a boost in your study habits? Success Coaches support your educational journey by sharing study strategies that complement your preferred learning style. We will examine your preferred learning style, develop tools to assist in your test preparation and cultivate tools to build your success on tests. Do you know your ICC academic pathway? Success Coaches assist you in discovering your pathway to completion at ICC. We will discover what your aspirations are and complement them with courses to map out a successful academic plan. Are you ready to find your success at ICC? Make an appointment with the Student Success Center.